I'm typing this and waiting for Match of the Day to come on. I'm watching the final piece of the News and they do a Football report. "Now if you do not want to know the scores, then look away." The games finished 5 hours ago. This malarky is stupid. What do they do before they show a WWII film. "Now if you do not want to know who won, then look away." This is a silly carry on. Ok men - onto the Chess. Above is the new English logo. Everyone I know has been emailed with it. Notice Board warning people about it. themselves the British Chess Federation. system in line with the rest of the planet. the day of the month and subtracting your D.O.B. they could have had a laugh. brilliancies that lay forgotten in old score books. with absolutely no counter play. Yet White wins! If you don't want to know the result, look away now. whilst they calmed him down. (yes I should played 18 Rxc6). is actually a mate in 9. So send me your swindles. Now something that makes it all seem worthwhile. I read your column frequently even though I am visually impaired. I wonder if you could use me as a subject for a future column. I am a visually handicapped Chess player born and living in Greenock. after being seeded 32nd out of 33! World Braille Champion Vladimir Berlinsky of Russia. This will be subject to finding sponsors of course. might find interesting enough for your column. against Michael Dyer. A complicated King's Indian. and in some cases back up an h4-h5 attack. and obtaining a very strong a few moves later. variations sitting in the background. up some stiffer endgame resistance. (a gut feeling telling me there were tricks on board). This is the trap. Would white go for the c-pawn? 40 Kf5!! Rxe6 41 Kf5 Re2 42 Kf6. looks very plausible getting the c-pawn. If White had played 40 Kd4 we would get this position. from protecting the e-pawn thus freeing the Rook. Meanwhile the black h-pawn suddenly looks very big. checks. The King holds the e-pawn freeing the Rook. An idea worth storing in the grey cells. Thanks Stephen and good luck getting sponsorship. the strength of his move 9 Qa4 (9 a3 was better). in his opponent's path making the win as difficult as possible. One clear win for black arrives in this position deep in the allegro. Black played 47...Ra5. The win is 47...Rb5!. more moves just to demonstrate the draw. A long hard game. emailed me for one of my knitted jumpers. 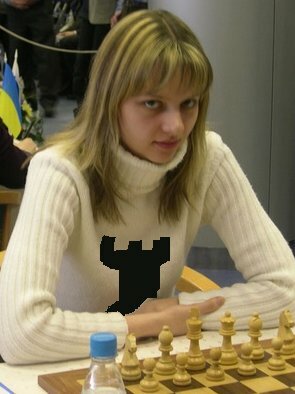 as an excuse to post a picture of a pretty girl chess player.